Add a Countdown module to show urgency to register for an event, availability of a product and more. This type of countdown starts as soon as user visits your page. It uses browser cookies to track him and displays unique timer. Creating time sensitivity on your sales pages is one of the best conversion optimization technique. You can implement it easily with this module. Have an upcoming event that your users should to know? Use a fixed countdown timer. It will basically count down till the certain date and time giving your audience a clear picture about the event and the time left for it. We give you a choice between two kinds of countdowns that can be customized and used according to the nature of your offering. Do you want to give another chance after the timer runs out? 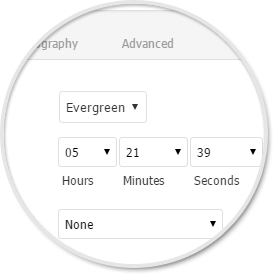 You can reset the timer every time it runs out to make sure you give another chance to your users. Whether you wish to display an offer, an upcoming event, a webinar or a product launch; the countdown timer is an aid for all. Do you have a special message for users who couldn’t take the offer within the precise time? You can display a message immediately after the timer runs out. Have some funky label caption in mind? With several settings for styling and formatting you can edit the label caption text too. Do you have something interesting to show up when a timer runs out? You can simply redirect a user to another offer page on your website. Sign up for our webinar today and get a free gift valued at $150. Space is limited. Reserve a spot now. Final Chance Before the Price Increases to $49.00!